Canada has an affordable housing crisis and the federal government must work closely with the provinces to help curb it, say mayors and a national co-op housing group. The average price of a new home in Canada nearly doubled between 2001 and 2010. Combined with rental shortages and soaring personal debt, these factors have all contributed to the crisis, effectively pricing many Canadians out of the market. Housing co-operatives and big city mayors say the federal government must work with the provinces to create a national housing strategy—one that focuses on affordable housing. “The cry is coming now not just from us. It’s coming from the Federation of Canadian Municipalities and it’s coming from the provinces, because this housing is in their backyard. It’s not on Parliament Hill—it’s in the cities and provinces across the country,” says Nicholas Gazzard, executive director of the Co-operative Housing Federation of Canada (CHF). Hundreds of people gathered in Calgary last week for the CHF’s annual meeting. 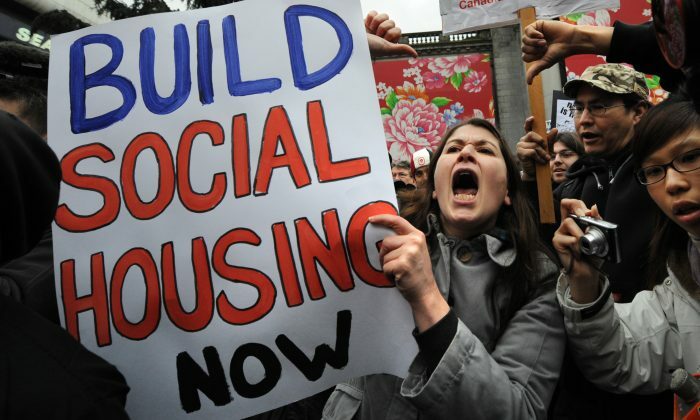 Among the most urgent issues discussed, says Gazzard, is that nearly half a million Canadians living in non-profit and co-operative homes are under threat of losing their federally funded housing subsidy agreements, set to expire in the next few years. “The people who will be most impacted are the most vulnerable people in our communities—people on fixed incomes, seniors, people with disabilities, even the frail elderly will be affected, because these are typically the kind of households that need help to pay their rent,” he says. Affordable housing was the number one priority to emerge from the recent Big City Mayors’ Caucus (BCMC), a meeting of mayors representing Canada’s 22 largest cities. “The rising cost of housing is an issue we see in cities across the country,” says Vancouver mayor and BCMC chair Gregor Robertson. Federal and provincial governments have downloaded housing responsibilities and costs onto municipalities for years, says the Federation of Canadian Municipalities (FCM), without providing adequate funds to do the job. “Federal investments are generally short-term and ad-hoc, offering temporary assistance but never repairing our broken housing system,” says a statement on the FCM website. Municipalities are calling for a housing partnership by all levels of government dedicated to stimulating new rental and affordable housing construction with tax incentives or other measures. Preserving or renovating existing social housing units, and eliminating chronic homelessness, are also top priorities. Achieving this will require renewing the expiring federal housing subsidies in the long term, say mayors. “Record levels of household debt, new economic realities, and changing demographics mean we can no longer rely solely on home ownership to meet Canada’s housing needs,” says Robertson. The federal government says the 2013 Economic Action Plan affirms its commitment to finding housing solutions, proposing more than $1.25 billion in funding over five years to renew the Investment in Affordable Housing (IAH) to 2019. The IAH is a collaboration between Ottawa and the provinces and territories to reduce the number of Canadians in housing need, as well as funding to improve living conditions in First Nations communities. The government will also invest $2 billion in housing through the Canada Mortgage and Housing Corporation (CMHC). “These investments are improving the quality of life for low-income Canadians, individuals who are homeless or at risk of homelessness, low income seniors, persons with disabilities, recent immigrants, and Aboriginal people,” said Dr. Kellie Leitch, parliamentary secretary to Human Resources Minister Diane Finley, in his address at the CHF’s annual meeting. There is still no guarantee, however, that the annual $1.7 billion in federal subsidies will be renewed as agreements come up for expiry between 2014 and 2019. Those subsidies will shrink by $500 million a year beginning in 2014. About 1.5 million Canadians, or 12.7 percent of all households, live in “core housing need”—spending more than 30 percent of their monthly income on rent, according to the FCM. There is an estimated 300,000 homeless people either sleeping outside or living in emergency shelters across the country. In Ottawa, there are 9,000 families on the affordable housing wait-list, which has been known to drag on as long as seven years. Calgary and Waterloo have more than 3,000 families on wait-lists, while Metro Vancouver has 4,100. In Ontario, more than 150,000 people are currently waiting for affordable housing.